Though many studies have shown that teachers have large effects on student achievement, we know little about the degree to which teachers affect a broader set of student outcomes. In a new paper forthcoming in the Journal of Human Resources, I explore how teachers affect a range of student skills and competencies beyond those measured by multiple-choice tests. Building on work by Kirabo Jackson and others, I analyze data from six large school districts that administered supplemental achievement tests comprised of more cognitively demanding open-ended items as well as student surveys capturing a range of socio-emotional measures. I find that teachers have large impacts on students’ performance on complex open-ended tasks in math and reading. That is, teachers differ substantially in the degree to which they support student gains in academic achievement relative to what we would have predicted based on students’ prior performance. Student surveys also revealed impacts on students’ attitudes toward learning, including their growth mindset, effort in class, and grit. As shown below, the size of teacher effects on students’ complex cognitive competencies and socio-emotional outcomes are just as large as teacher effects on traditional state standardized tests in math and reading (first two bars). At the same time, I find that individual teachers vary considerably in which student outcomes they are most effective at developing. More than one out of every four teachers who is in the top 25 percent of teacher effectiveness based on standardized test scores is in the bottom 25 percent based on social-emotional outcomes. Teachers can be effective at developing grit, problem-solving skills, and a growth mindset, while struggling to raise test scores, and vice versa. 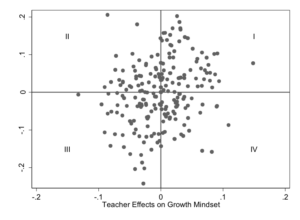 For example, the figure below plots the estimate impacts of 228 teachers on two student outcomes, growth mindset (x-axis) and math achievement (y-axis). A total of 42 percent of teachers in the sample have above average effects on one outcome but below average effects on the other (21 percent in quadrant II and 21 percent in quadrant IV). Only 28 percent of teachers have effects that are above average for both state math tests and growth mindset (quadrant I). The substantial variation I find in teacher effects on students’ complex task performance and social-emotional competencies further reinforces the importance of teacher quality but complicates its definition. Measures of teachers’ contributions to students’ performance on state tests in math are strong proxies for their effects on students’ abilities to solve complex math problems. 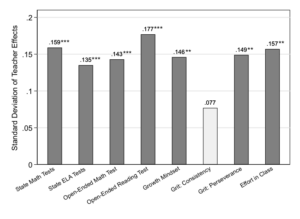 However, teacher effects on state ELA tests contain more limited information about how well a teacher is developing students’ abilities to reason about and draw inferences from texts. Teacher effects on state tests are even weaker indicators of the degree to which they are developing students’ social-emotional competencies. Current accountability and evaluation systems in education provide limited incentives for teachers to focus on helping students develop complex problem-solving skills and social-emotional competencies. Findings from this paper suggest that neither value-added to state tests, observation scores, student surveys, nor principal ratings serve as close proxies for teacher effects on important skills and competencies not captured by state tests. Going forward, we need to know more about the types of curriculum, instruction, organizational practices, and school climates that allow teachers to develop a wider range of students’ skills and competencies than are commonly assessed on state achievement tests. MESH – Mindsets, Essential Skills, and Habits – refers to the subset of intrapersonal and interpersonal mindsets and competencies that have shown to be: meaningful, measurable and malleable. Examples of MESH include self-management, growth mindset, and social competence. Matthew Kraft is an assistant professor of education and economics at Brown University. You can read about his research at www.matthewakraft.com and follow him on Twitter @MatthewAKraft. Great information to have to consider in supporting educators’ professional learning and efficacy. The TransformEd blog was launched with the intent to help spark and inform many conversations about whole-child development. Transforming Education is interested in understanding the variety of programs and practices that support students in building the mindsets and skills they need to thrive, and we are committed to enabling rich and engaging discussions that can inform the field. The views and opinions expressed in this blog are those of the authors and do not necessarily reflect the position of Transforming Education. We do not endorse specific programs or providers. We’re always interested in featuring new voices on the blog! Contact us to learn how to contribute. All content is licensed under a Creative Commons Attribution-NonCommercial-ShareAlike 4.0 International License. Subscribe to our newsletter to receive the latest information on whole-child development.